Deep brain stimulation (DBS) has improved the lives of thousands of people with Parkinson’s disease (PD) since its 2002 FDA approval. By delivering electrical currents to the basal ganglia, the region of the brain that controls movement, the so-called “brain pacemaker” can relieve tremor, rigidity and other motor symptoms that debilitate PD patients. DBS, which can also treat epilepsy, essential tremor and obsessive-compulsive disorder, is already used by 100,000 patients worldwide. “The technology can have almost miraculous effects,” says Warren Grill, the Addy Professor of Bioengineering at Duke—but it’s not perfect, or even fully understood. For the past decade, Grill and his team have sought to learn more about how DBS works and how it can be improved. Now, their transformational technology is making DBS therapy for PD not only more effective, but safer and less expensive. The novel technology, Temporally Optimized Patterned Stimulation (TOPS™), sprang from a new insight into how to combat one of the critical biological problems in PD: as the disease causes dopamine-producing cells to die and dopamine levels in the brain drop, neurons stop signaling in normal ways and instead begin firing in lockstep with each other. Those abnormally synchronous signals send faulty messages to the rest of the body, disrupting motor activity. DBS works by delivering rapid electrical pulses to the basal ganglia via implanted electrodes connected to a pulse-generating battery. Those electrical pulses somehow block or cancel out signals from the misfiring neurons, thereby restoring normal motor activity. Existing DBS batteries stimulate the basal ganglia at the rate of 130 to 200 regular pulses per second. Figuring out exactly what rate to use is tricky, though—while it has to be high enough to control symptoms, if it’s too high patients can suffer side effects including unwanted movements, disrupted speech or cognitive problems, says Grill. Furthermore, those rapid pulses quickly wear down the battery. Most patients need a replacement every three to five years, requiring expensive surgery. Pratt BME doctoral student David Brocker was tasked with using optimization in a computer model of the basal ganglia to find the best pattern. Ultimately the team created TOPS. Unlike conventional generators that emit a steady stream of pulses, TOPS pulse generators deliver intermittent patterns of stimulation at about 45 pulses per second—each lasting only one-tenth of one-one-thousandth of a second. Grill likens the resulting pattern to Morse code. A clinical experiment to evaluate the technology—conducted in collaboration with Duke’s Dennis Turner, MD, and neurosurgeons at Emory University and Wake Forest Baptist Medical Center—yielded promising results, published in the January 2013 issue of Experimental Neurology. 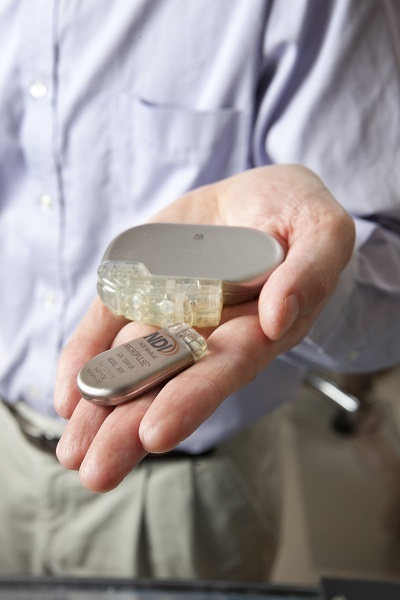 The upshot: TOPS technology appears to make DBS more effective at relieving PD symptoms and to greatly extend the life of neurostimulator batteries—resulting in fewer battery-replacement procedures. This translates to fewer risks and complications for patients and lower medical expenses overall. Another plus: the pulse-generator battery—typically implanted above patients’ collarbones—is about half the size of traditional batteries. 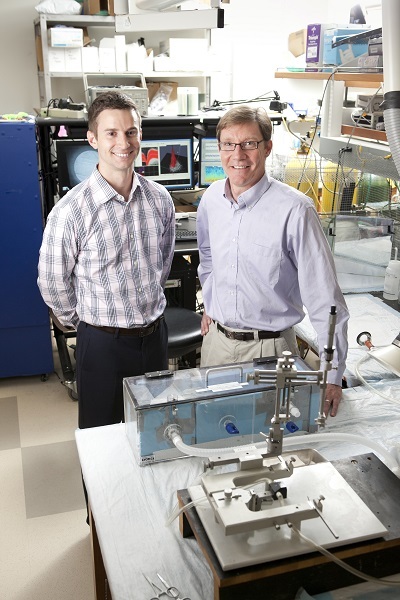 As the therapeutic value of TOPS became clear, Grill and his team began working with Duke’s Office of Licensing and Ventures (OLV) to translate the innovation from the lab to a commercially available device for use in patients. The result was the development of the NDI Micropulse™, as well as the May 2013 launch of Deep Brain Innovations, LLC, a portfolio company of NDI Medical, LLC, a firm that funds and develops promising neurodevice technologies. Grill is NDI’s chief scientific officer. NDI president Geoff Thrope says the most important thing about translating an idea into a successful commercial enterprise is to understand and be guided by the needs of the end users. The next step, say Grill and Thrope, will be to request FDA-sponsored clinical trials for a TOPS-based device, which will take several years to complete. In the meantime, they’ll continue investigating the best way to get TOPS technology to patients safely, strategically and expeditiously. "The beauty of this technology is that it will work not only for PD patients – the most prevalent existing population – but also for anyone with a neurological condition for which DBS has proven effective," Thrope says. "So the opportunity to impact the treatment of these conditions in a more efficient and elegant manner is extraordinary."